Being straight up, news of event War Of The Green Lanterns so quickly after Blackest Night had my battery running on low. The idea of rolling multi-title crossovers made my wallet groan. But you know what? War is so freakin' cool it's re-sparked my lantern love and some of my favourite characters along with it. Especially John Stewart. The biggest chunk of that pie goes down in the pages of Green Lantern Corps #60. 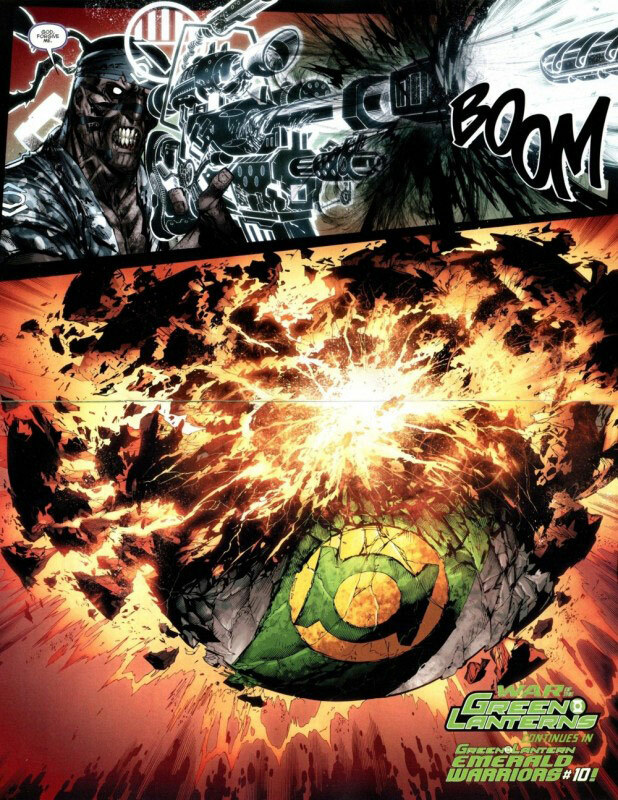 Here Kyle Rayner and Stewart touch down on the hijacked planet sized G.L. Mogo, whose currently spewing out Krona's infected rings in order to increase the madman's possessed army of Green Lanterns. Having abandoned their own rings for the untainted rings of hope and compassion respectively, Kyle trying to reverse the tide of the war, generates an image of Mogo's deceased partner Bzzd in order to free his mind. 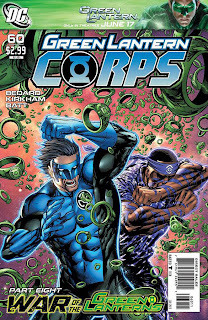 Only all the Black Lanterns Mogo inhaled via gravitational pull during the Blackest Night (Green Lantern Corps #44) have left their rotten energy at his core and Kyle's shot at hope brings it all bubbling to the surface. 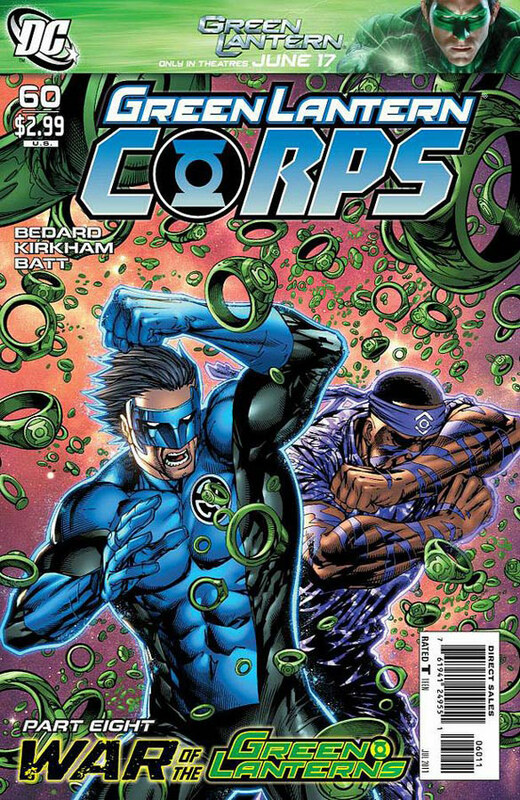 However, as possessed Lanterns continue to bare down on the pair, John Stewart reveals Kyle's not the only one with a bullet in the chamber, and makes a call only a former solider could. 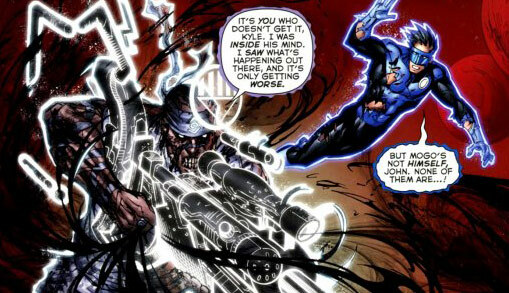 Using his indigo abilities John absorbs the power of the black, forming a massive sniper rifle. Then against Kyle's protests of hope for his mind controlled teammate, Stewart brings the factory down. To see how, click through to the next page [Spoiler Warning]. Tyler Kirkham has been my top current GL artist since the early stages of this title's The Weaponer story-arc. Seeing how he handles this scene, makes me glad he's staying with the franchise post September's relaunch over in the Kyle based Green Lantern: The New Guardians. What will become of Mogo's 'death' after the relaunch is as interesting, as is how John and his fellow G.L's will reconcile his actions. If it is as well written as this 8th chapter of War by Tony Bedard, then fans are really in for a treat. Myself included. And he's back wearing the red ring! I almost thought he'd keep it on for a bit there!